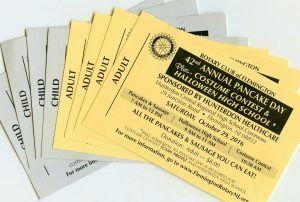 The Rotary Club of Flemington held it’s 42 Annual Pancake Day fundraiser plus Costume Contest and Halloween High School. It was held on Saturday, October 29, 2016 in the Commons at the Hunterdon Central Regional High School. Click Here view the Photo Album from the event. A very special thanks to the Rev. Dr. Herb Bohler for taking the photos and generating the album for everyone to enjoy.